Think you need to eliminate fats from your diet to lose weight? It is a common misconception that fat is bad for you and will make you gain weight, but it is a bit more complicated than this. You see, all fats are not created equal. Sure, there are fats that should be avoided because they are harmful to your health and will make you gain weight, but there are also many fats that you can eat that will boost your health and your weight loss. Just because you are trying to lose weight doesn’t mean you should fear fats. Take a look at the keto diet. Many people see a lot of success with this diet. Keto is based on increasing your fat (up to 75% of your calories) intake and minimizing your carbs. If it were as simple as fats making you fat, then this diet would never work. What Do We Mean When We Talk About Fat? Foods are made up of three primary macronutrients: proteins, carbs, and fats. The body needs all three macronutrients to function properly, meaning that you need to consume fats for your body to operate. Fats perform different roles in our body when consumed, from helping our body to maintain healthy cells to nutrient absorption. Fats also help provide your body with energy. The key is knowing which fats you should be consuming and how they affect your body. The type of fat you consume matters, and chances are up until this point you’ve been eating too much of the wrong fat. Not all fats are created equal, and some will help you lose weight while others will drag down your health and only add on the pounds. Healthy fats are broken down into two different types; 1) polyunsaturated fats (PUFAS) and 2) monounsaturated fats (MUFAS). Polyunsaturated and monosaturated fats are known to decrease your bad cholesterol (LDL), increase your good cholesterol (HDL), and decrease your risk of heart disease. They are also good for your brain health and help you feel full throughout the day. Saturated fats are more complicated than unsaturated fats. Some of them should be avoided, and some of them could be good for you. 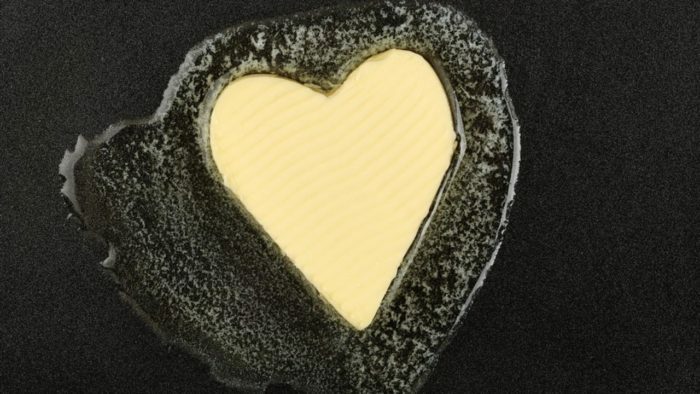 For a long time, it was thought that all saturated fats raised your cholesterol and contributed to heart disease, but recent research shows that many saturated fats actually lower your bad cholesterol (LDL) and increase your good cholesterol (HDL). And, like unsaturated fats, saturated fats can help you feel fuller throughout the day. There is a simple, easy way to tell the difference between a saturated and unsaturated. 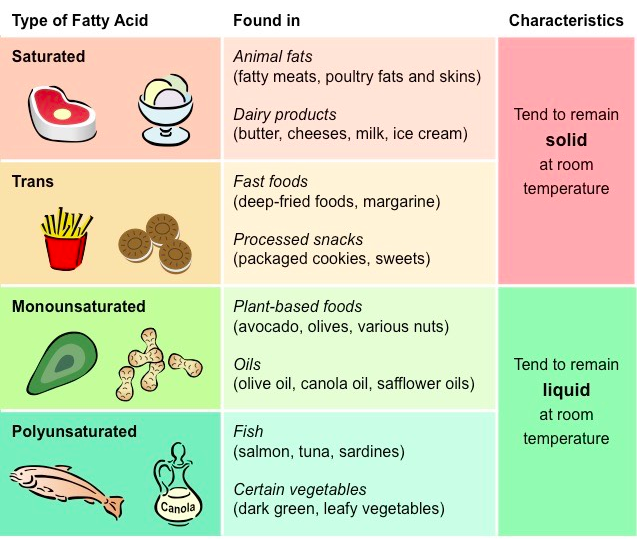 If the fat (or oil) remains a liquid at room temperature, you are most likely dealing with unsaturated fat. If the fat (or oil) hardens at room temperature, you have saturated fat. There are many fats that you should include in your diet, but there are also fats that you need to avoid. Consuming trans fats can be harmful to your health and even cause weight gain. These are the fats that will make you fat. They will also raise your risk for heart disease, stroke, diabetes and raise your bad cholesterol (LDL). Some animal products contain natural trans fats, but the majority of trans fats are created industrially processed. This fat is mostly found in foods that are packaged, fried, baked, and processed. The reason trans fats are used in these foods is that it is inexpensive and has a more desirable taste than natural fats. One way to avoid trans fats is to avoid processed foods and only consume all natural, whole foods. If you use fats right, they can help you lose weight because they help keep you satisfied and full throughout the day. This means that you are less likely to snack, binge, or overeat, leading you to consume fewer calories naturally. They also help provide your body with energy, especially if you are limiting your carb intake. Consuming the right fats in the right portions is one of the keys to a successful weight loss strategy. If you don’t already have a strategy that is working for you, then it may be time to get on a Custom Meal Plan, and if you are a member of Team Possible, you can get on one at a steep discount. When you choose to get on a Custom Meal Plan, we design a plan that is based on your individual needs, the foods you already like, and the diet plan you would like to be on, whether you want to try keto, carb-cycling, or clean eating. Moreover, when you join my team, not only do you get a discounted meal plan, but you also get direct access to my community where there are people just like you to support you throughout your journey and me. Whether you decide to join my Team, sign up for a meal plan, or just want to lose the weight on your own, pay attention to the types of fats that you are eating. Focus on your polyunsaturated fats and monounsaturated fats, eat your saturated fats in moderation and avoid your trans fats, especially if they are artificial (processed).